Antonio Villas-Boas/Business InsiderThe Surface Laptop 2 is Microsoft’s most straightforward laptop. Microsoft’s new Surface Laptop 2 sells for $US999. Microsoft didn’t re-invent the wheel with this year’s version – it’s quite similar to last year’s model. 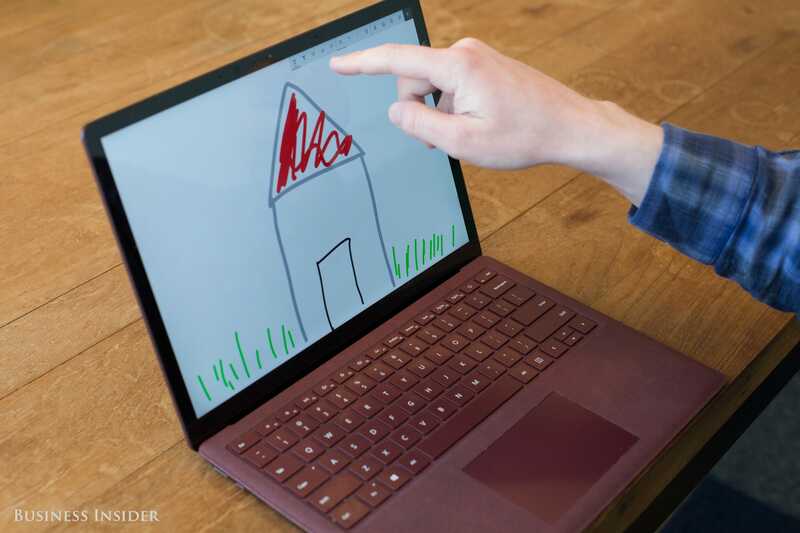 But that’s a good thing: generally speaking, the Surface Laptop 2 is a wonderful little laptop that stands up to the best of Apple. The keyboard feels springier and more responsive, the trackpad has a better texture, and the device is light and thin. The Surface Laptop 2 also gets about six hours of battery life. In mid-2017, Microsoft released the Surface Laptop, a break from the norm for the Redmond tech titan’s growing hardware business. Where Microsoft’s other PC hardware all came with some kind of gimmick – the Surface Studio PC folds down to a drawing desk; the Surface Book laptop’s screen detaches – the Surface Laptop was (mostly) a straightforward touchscreen laptop, with nothing but a solid design and a weird fabric-coated keyboard to set it apart. And yet, the Surface Laptop distinguished itself by being actually really good; at least as good, if not better than, the Apple MacBook, its closest competitor. With the Surface Laptop 2, available now for a starting price of $US999, Microsoft really didn’t re-invent the wheel. I’ve been using it for a few days now, not enough for a full review, but enough to tell you that with this laptop, the good news is the bad news. The bad news is that it means the Surface Laptop 2 isn’t wildly different from last year’s model, including some of its quirks. The good news is that, generally speaking, this thing is a wonderful little laptop that stands up to the best of Apple. 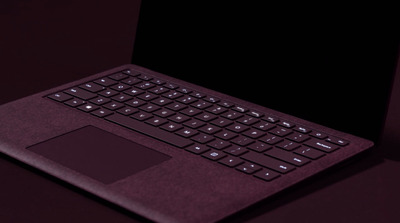 Also annoying is the fact that the Surface Laptop 2 doesn’t ship with a USB-C port, the latest and, honestly, greatest standard for connecting accessories. Whereas Apple dropped the ball by going all-in on USB-C too soon, making it the only port on its recent-model MacBook and MacBook Pro laptops, Microsoft is weirdly running the other direction by not including a USB-C port at all. MicrosoftThe Surface Laptop 2 comes in multiple colours, but it’s all fabric-covered. 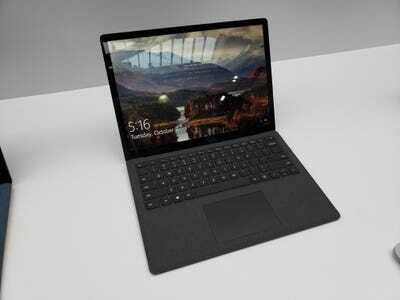 The Surface Laptop has one standard USB port, a mini-DVI port for hooking up a monitor, Microsoft’s proprietary Surface Connect port for charging, and a headphone jack. Your mileage may vary, but I tend to believe that a USB-C jack, instead of that mini-DVI port, would have been a better balance between old and new. It’s also decidedly not a gaming laptop. It’s more than sufficient for everyday tasks like web browsing, Microsoft Office, etc., but it doesn’t have the graphical hardware to play big-ticket recent releases. I couldn’t get “Forza Horizon 4,” the gorgeous new racing game, to run on the Surface Laptop 2 at all. Just be advised. Anyway! These are quibbles. On to the good. Other than my port woes, I actually like the Surface Laptop 2 quite a bit. In terms of tangible upgrades from last year’s model, they’re few and far between. Most notably, it now comes in an extremely slick matte black colour option, which is the model I’m using. Let me tell you, it feels like sending Facebook messages from the cockpit of the Batmobile. Otherwise, it’s a lot of little improvements. The keyboard, already better than that on the most recent Apple MacBook Pro, feels springier and more responsive. The trackpad seems to have a slightly better texture, too. At 2.76 pounds, the Surface Laptop 2 is also light and thin enough to lug around. Melia Robinson/Business InsiderThe original Surface Laptop. Yep, it’s pretty much exactly the same. Under the hood, it has refreshed internals, including the latest Intel processors. Battery-wise, I’m getting about six hours with lots of tabs open in the Microsoft Edge web browser (which, by the way, is just fine. Still not as good as Google Chrome, but fine, with some thoughtful little touches). The nicest, and truest, thing I can say about the Surface Laptop 2 is that it’s just a joy to use. No gimmicks, no weird drawbacks. It’s just a good laptop with a good keyboard and a good trackpad with good battery life that’s a pleasure to use. If you need more power, I recommend the Microsoft Surface Book 2. For gaming, Dell, Razer, and others have laptops custom-built for that purpose. For the true road warrior, there’s the Surface Go and the Surface Pro. But if you just want a good laptop that will help you do things, especially if you’re a student or a would-be Apple switcher, the Surface Laptop 2 is a very strong option.